Hurricane battered we enter the autumn of this chapter. There are no physical seasons in Florida. Only hot and hotter. I’ve been going to see my friend Jubal lately. He doesn’t have any cats and I’m okay with that. We are roughly the same age. A contemporary you might say. He gets me which is why he can invite me into his inner sanctuary or send me away without hestitation. Jubal owns a loft in Fort Lauderdale, near the city’s urban core. He works with his hands and often goes away for months to work on ships. He is intelligent in a way I cannot think. Like a lot of my friends, Jubal believes the world is screwed and yet he seems to come up with an amusing antidote for all of the world’s ills. As we stood on his rooftop watching jets hum all around, Jubal noticed me studying the surroundings. “No, we’re not in the country,” Jubal remarked. Buildings in the horizon and the sounds of bus brakes and car horns on the streets below signal we are indeed in a city. Night comes quicker now. Darkness gaining the upperhand on light. Hurricane Irma wrecked havoc on South Florida and the Keys. Hurricane Maria destroyed Puerto Rico. Jubal called the storms “weak.” It was his way of projecting strength in the face of challenging times. The jets we watched arriving and departing were not all commerical passenger airliners. Some were four engine turboprop transport planes carrying supplies on search and rescue missions. “San Juan will come back,” Jubal said in a serious tone. It was a rare moment for him. The hurricane season was yet another blow in a depressing year. What started with a change in Washington has went downhill fast. Tricked into thinking I could be a politician again and fueled by ego and regret — a dangerous combination — I lost a summer to grief. Knowing I need to snap out of it before hit with a real loss to my soul I have begun seeking atonement. David continues to care for me and is a dedicated and loving spouse. Geraldo, Daniel, Jubal and Horacio are friends I deeply love. I am grateful people still pay me to write. Freelance journalism, contrary to what some might say, is not free. I continue to seek adventures in far off lands and until that day comes I will make the most of my time with family and friends in Florida. As my therapist tells me, we create our own attitudes. We can choose to create sadness or joy. I’m ready for joy. Let me take this phone call. Here we are starting over again. Looking for work after a brief flirtation with politics. In the gutter looking up at the stars, wrote Oscar Wilde. The summer approaches again in Florida. I have become numb to the lasting heatrays and all of the complexities of urban dwelling. I rarely go to Miami anymore. I don’t have enough money to go many places. David and some friends have encouraged me to get back in the gym. I’ve been playing golf and basketball again and swimming regularly. I’m surprised how well my body has held up. I considered running again for the state house but after two months on the trial determined it was the wrong district and wrong role. I remain in contact with friends from the park service and maintain hope a position will open up. It would be nice to breathe fresh mountain air again. Last week, David and I attended a presentation from the Sierra Club. Members of the executive committee discussed pollution of Florida’s waterways and various other environmental concerns. I asked one of the speakers if she felt South Florida had an overpopulation problem. “The world does,” was her response. The arrival of more and more people in Florida means draining the swamp to house them. There is another way, however, but it would take acts of kindness, sacrifice and generousity to get there. Not exactly known traits a keen political observer would recognize from current Republican leadership. In many parts of the South Florida shoreline sit towering condominums and apartment buildings. For half of the year they operate at significantly less capacity due to retreating Canadians. There are quite a few old buildings on the east side of Interstate 95 in South Florida. Old properties, in some cases. In dire need of rehabilitation. After recognizing a problem, it takes a community — or village, if you prefer, — to improve a habitat fit for all humanity. Good deeds, Pat from Palm Beach tells me. “You can only resist and be against everything for so long before it wears you out,” Pat said during our recent phone conversation. Living positively with a can do spirit while avoiding the pitfalls negativity produces is the plan. This my inner call to action. It won’t be easy. Florida is such a weird state. It’s diverse melting pot is, at times, exhausting. I take comfort in the fact that periods of hardships strengthen resolve and make families better when they emerge from a struggle. My friend Geraldo is doing so much better. His recovery brings tears to my eyes. My brother is settling into life as a divorced father. I wish him patience and compassion to continue giving the girls a healthy upbringing. And now I look to David, my loyal husband, an offer a humble plea. After rehabbing our reps in Florida, I hope we can visit your family on the West Coast. Our eight years together has not been equitable in meeting the in-laws. I’d like to change that. For the better, of course. One of my intentions in coming to Glacier National Park was to study climate change. That all went out the window when I recognized the extent of my job description. To this end, I have not been able to explore as much of the park as my previous experiences in Grand Canyon and Yellowstone. One of the first things we were told in orientation was to not “lecture” the guests and visitors on the subject of climate change. It is a hot topic — pardon the pun. So, off duty, I decided to take an informal poll. “It shouldn’t be a political issue, it’s a human issue,” said one of my younger co-workers. The kid is earnest. Twentysomething. Tall, gangly with long hair and a mustache. Works maintenance around Lake McDonald Lodge. It would be fair to call him a hippie. 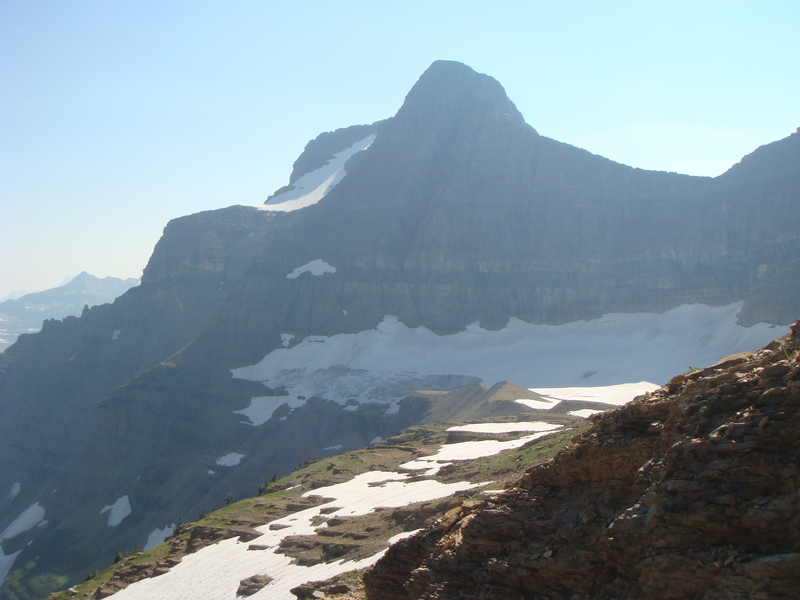 Human or Political, whatever your view, “Climate Change” had come to Glacier — many times. For there is one thing that is absolutely certain … climate does indeed change. Intrigued by the company’s line of evasion, I attended several of the Park Service’s environmental programs, where I found more dodgy rhetoric. One of the park’s artists in residence — a songwriter from Texas (surprise) — even refused to reveal his thoughts on climate change, prompting a snarking tourist to ask if he would return to the park once all the glaciers are gone to write a song about it. Nerd humor at its finest hour. The glaciers are receeding rapidly. When the park opened in 1910, there were roughly 150 documented glaciers. Presently, there are 25. Call it global warming if you want, but the moving rivers of ice are leaving and what they are leaving behind is quite spectacular. My ranger friend Christian was the first to truly open my eyes to this whole climate change thing. He was right. These jagged alpine mountains got their rugged good looks from centuries of glacial carving and receeding. And the Ice Age doesn’t appear to be coming back anytime soon, folks. This summer has been hot. Very hot. In the swealtering Lake McDonald Valley, temperatures have climbed into the 90s quite regularly. Tourists from sun states such as Florida and California, seeking a break from the heat, have surprising found themselves baking aboard one of our red buses. Meanwhile, seeking a break from the crowds, I embarked on my first challenging hike of the summer — a 10-mile trek on Siyeh Pass. It was a near 4,000 foot elevation gain during the heat of the day. I did it alone — and without bear spray. Fear be damned. It was an incredible adventure, taking me back to those Grand Canyon hikes with Desmond as the sun beat down and yet I kept climbing, switchback after switchback. A day later, my knee would not forgive me. At the hike’s summit, 10,000-ft Mt. Siyeh, I stopped to eat my sack lunch and gaze across the park. I was indeed on top of the world again. There was a lot on my mind as I made my descent into Sunrift Gorge. My summer in the International Peace Park had been anything but boring. I was learning a great deal about management and transportation logistics, while beginning to understand the science of climate. And while the experience had left me frustrated and exhausted at times, I am quite certain now I will leave here with new and vitally important skills. The unkown at this time is just exactly where I will apply those skills next. It may be peaceful in the park, but outside, in places such as Iraq, Gaza and the Ukraine, it has been the summer of war. There is conflict along the Mexican border and civil unrest in Missouri. And on top of all of that, there’s a campaign heating up in Florida.